Obesity needs to be tackled in the same way as climate change, a top nutritional scientist has said. The chairman of the International Obesity Taskforce wants world leaders to agree a global pact to ensure that everyone is fed healthy food. Professor Philip James said the challenge of obesity was so great that action was needed now, even without clear evidence of the best options. He also called for stricter rules on marketing and food labelling. He commented: "This is a community epidemic that is actually a response to all the wonderful apparent industrial and economic development changes that we've seen, with a collapse in the need for physical activity, and now a targeting of children to make profits by big industry in food and drink. "We have to change that, and it will not come unless we have a coherent government-led strategy. The issue is: have we got the political will?" 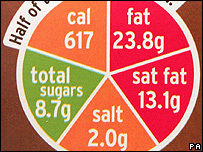 He added that it was important that all food used a "traffic lights" labelling scheme so that consumers could immediately assess fat, sugar and salt content. "This is a form of public education which is being resisted mightily in Brussels with intense lobbying of commissioners who've just announced that they won't go down the British road," he highlighted. "So we're in the process of trying to make it clear that if you're concerned about the health and economics of a society you should take this seriously." Ten percent of the world's children are either overweight or obese, twice as many as the malnourished, said Professor James. "A huge range of analyses show that we have not been looking at the problem of children's nutrition and well-being properly. "They're disadvantaged from birth, their academic achievement is impaired, their earning power is diminished, and they almost certainly have a life expectancy which is less than that of their parents." New data from Scandinavia showed that the weight of a child at the age of 7-12 predicted whether or not they were going to die early from heart disease or other problems, he said. "We now have to think in a totally different way and recognise that it's the life cycle," he added. "Because these children start off being born small, they are then exposed to totally inappropriate environments, and they are therefore super-sensitive." Another expert, Professor Rena Wing, presented research at the AAAS in Boston suggesting that large-scale changes in diet and exercise were needed to prevent obesity. A study of 5,000 men and women who lost an average of 70lbs (30kg), and kept the weight off for six years, shows that large lifestyle changes - such as exercising 60 to 90 minutes a day - were needed to keep people slim. 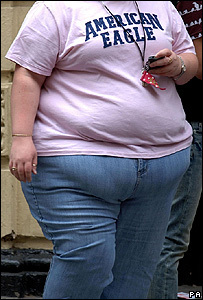 "The obesity epidemic won't go away simply because people switch to skimmed milk from whole milk," she said. "They need to substantially cut their calories and boost their physical activity to get to a healthy weight - and keep minding the scale once they do."